American coin silver large Medallion napkin ring with double female and male Medallions, c.1860. 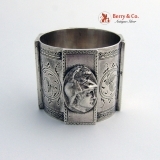 This handsome napkin ring is 2" in diameter, 2" tall and weighs 54 grams or 1.7 ozs Troy. The excellent original condition and clear, crisp detail, with no monograms, removals, repairs or alterations, make this an especially attractive offering. The soft, warm, original finish is present, with no buffing or machine polishing. American sterling silver 4 piece demitasse set in the Northern Lights pattern by International, 1946. 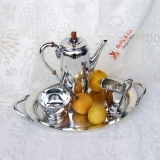 This elegant set is: the Coffee Pot is 8 1/2" tall, the tray is 15 1/2" long across the handles, total silver weight is 1729 grams or 55.6 ozs Troy. The soft, warm, original finish is present, with no buffing or machine polishing. The excellent original condition and clear, crisp detail, with no monograms, removals, repairs or alterations, make this an especially attractive offering. 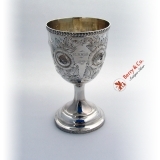 American coin silver goblet with Repousse strawberry and vine decorations, c.1860. 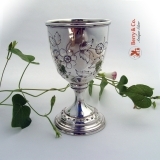 This beautiful goblet is 6 1/4" tall, 3 1/2" in diameter and weighs 187 grams or 6 ozs Troy. The excellent original condition and clear detail, with no monograms or removals, repairs or alterations, make this an especially attractive offering. 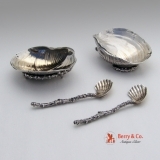 American sterling silver pair of shell form salt dishes and spoons by Gorham of Providence, RI, c. 1885 in the Narragansett pattern. The salt dishes are 2" long, 1 1/2" wide, the spoons are 2 1/4" long, total silver weight is 46 grams or 1.5 OT. Excellent original estate condition and clear, crisp detail, with no monograms, removals, repairs or alterations, make this an especially attractive offering. The soft, warm, original finish is present, with no buffing or machine polishing. The price is for the pair of salts and spoons. American sterling silver tea bell by Tiffany & Company, 1884. 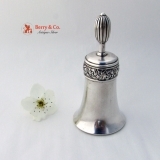 This elegant bell is 3 3/4" tall, 1 7/8" in diameter and weighs 95 grams or 3 Troy ounces. Excellent original estate condition and clear, crisp detail, with no monograms, removals, repairs or alterations, make this an especially attractive offering. The soft, warm, original finish is present, with no buffing or machine polishing. Vintage American sterling silver grape shears with figural fox eating grapes handle, c.1900. 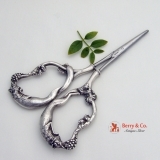 These beautiful shears are 6 1/4" long, 3 5/8" across the handles. Excellent original estate condition and clear, crisp detail, with no monograms, removals, repairs or alterations, make this an especially attractive offering. The soft, warm, original finish is present, with no buffing or machine polishing. American Arts and Crafts sterling silver figural salt dishes in a fork of a camp fire, made by Allan Adler, c.1960. These beautiful dishes on stands are 6" tall, 4" wide and weigh a total of 248 grams or 8 ozs Troy, both of the dishes have an applied monogram J. Excellent original estate condition and clear, crisp detail, with no removals make this an especially attractive offering. The soft, warm, original finish is present, with no buffing or machine polishing. American sterling silver napkin ring by Tiffany and Company Silversmiths, c.1875. 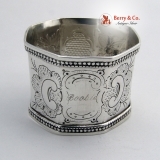 This very special napkin ring has applied decorative borders and an inside ornate, period script monogram: APA. 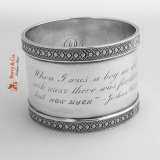 What makes this special napkin ring even more special is its inscription: When I was a boy we didn′t ask WHAT was for dinner, but HOW MUCH---Joshua Whitcomb. See the Wikipedia entry for Denman Thompson for more on Joshua Whitcomb. This truly special napkin ring weighs 57 grams or 1.8 ozs. Troy and is 1 7/8" in diameter and 1 3/8" tall. Monogrammed and inscribed as described above, the soft, warm, original finish is present, with no buffing or machine polishing. The excellent original condition and clear detail, with no removals, repairs or alterations, make this an especially attractive offering. American sterling silver and steel mechanical corkscrew by S. Kirk and Son, c.1900. This extremely scarce and very usable corkscrew has the old 925/1000 mark, plus the model number 5. 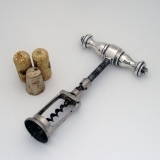 The heavy Capstan handle is 4 1/2" wide and the corkscrew is 7 1/4" long. The soft, warm, original finish is present, with no buffing or machine polishing. The excellent original condition and clear, crisp detail, with no monograms, removals, repairs or alterations, make this an especially attractive offering. 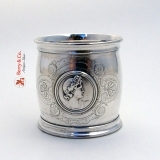 English sterling silver mug by Jonathan Swift Jr. having a full set of London Hallmarks for 1779. This beautiful mug is 5 1/8" tall, 4 3/4" across the handle and weighs 298 grams or 9.6 ozs Troy. 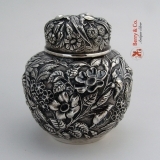 There is an ornate monogram AHC and floral chasing which could be later The soft, warm, original finish is present, with no buffing or machine polishing. The excellent original condition and clear, crisp detail, with no removals, repairs or alterations, make this an especially attractive offering. American coin silver oval napkin ring with an applied Medallion, c.1860. 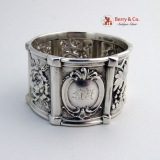 This beautiful napkin ring is 2 1/4" long, 1" wide, 1 3/4" tall and weighs 29 grams. Monogrammed JMG in an ornate period script on the back of the ring. The soft, warm, original finish is present, with no buffing or machine polishing. The excellent original condition and clear, crisp detail, with no removals, repairs or alterations, make this an especially attractive offering. We have two of these rings available! Early American coin silver napkin ring with floral repousse decorations, c.1850. 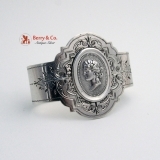 This beautiful napkin ring measures 2" - 1 1/4" and weighs 35 grams or 1.1 ozs Troy. The excellent original condition and clear detail, with no removals, repairs or alterations, make this an especially attractive offering. Monogrammed SF, the soft, warm, original finish is present, with no buffing or machine polishing. Antique Dutch silver windmill wine cup / stein, c.1860. 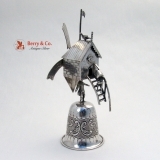 This fabulous item is made of a windmill house connected to a win cup with a sculptured figure of a man. 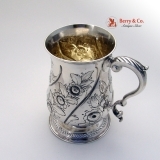 The wine cup is highly decorated with floral, foliage engravings. The windmill house is made with a large windmill connected on the other side to a small clock like looking hand / pointer surround by Roman numerals. The entrance to the windmill house is through a beautifully made staircase with a sculptured figure carrying a barrel up the stairs. 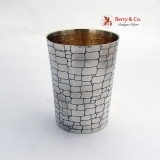 These kinds of cups were usually used as follows: One of the drinkers, usually there were several involved, would invert the cup and would fill the cup up with whatever was the home′s choice of schnapps or liquor. Then he′d spin the windmill wanes by using his fingers, this gets the vanes started in rotation, he then had to drink the contents of the cup before the vanes stopped going around. If not then he had to pay some type of penalty, which was determined by which number the hand / pointer stopped on. The list "of games" is pretty much endless and are very similar to the "dice cup" games, of which there are hundreds. The wind-flag, the dove on the thatched roof, and little figures on the banistered staircase, must have some long forgotten significance - but by the late 1700′s all of the cups evolved to almost always include them. Marked with antique Dutch silver marks and later marked with English import marks. This unusual cup is 6" long and weighs 89 grams or 2.9 ozs Troy. American sterling silver salad serving spoon in the Ivory pattern by Whiting, 1890. 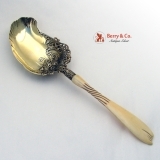 This beautiful spoon with original gilt bowl is 11 1/8" long. The soft, warm, original finish is present, with no buffing or machine polishing. The excellent original condition and clear, crisp detail, with no monograms, removals, repairs or alterations, make this an especially attractive offering. American sterling silver mixed metal mustard pot by Dominick and Haff Silversmiths, date marked for 1880. This most unusual pot has applied copper and gilt brass foliate and moth decorations set on an allover engraved ivy leaf background. Most mixed metal items are done on hammered surfaces. This very special pot is 4 1/8" tall, 2 3/4" across the handle and 2" in diameter, weighind 102 grams or 3.3 ozs. Troy. The soft, warm, original finish is present, with no buffing or machine polishing. The excellent original condition and clear, crisp detail, with no monograms, removals, repairs or alterations, make this an especially attractive offering. 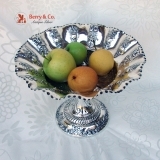 English sterling silver large Repousse pedestal base fruit bowl by Mappin and Webb having a full set of London Hallmarks for 1902 and the Retailerâ€²s mark for the maker. This exquisitely detailed Edwardian serving bowl has 15 lobed panels with Repousse fruit decorations and a pie crust edge, with heavily chased foliate decorations surrounding a center raised circular panel of Repousse Fruit. 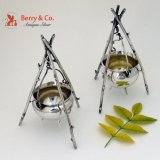 This special bowl sits on a circular pedestal base having conforming Repousse decorations with a band of Gadrooning separating the base fron the stem. Weighing 709 grams or 22.8 ozs. Troy, this desirable and very attractive bowl is 10 1/2" in diameter at the rim, 5 3/8" in diameter at the base and 7 5/8" tall. The soft, warm, original finish is present, with no buffing or machine polishing. The excellent original condition and clear, crisp detail, with no monograms, removals, repairs or alterations, make this an especially attractive offering. 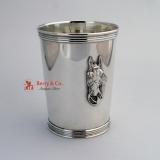 American sterling silver horse head beaker or mint julep cup by Benjamin Trees, KY, c.1960. This elegant cup measures 3 3/4" tall and weighs 135 grams or 4.3 ozs Troy. The cup has an inscription under the base. S Penn & Sons, Inc. The excellent original condition and clear, crisp detail, with no removals, repairs or alterations, make this an especially attractive offering. German 800 standard silver beaker with an engraved crocodile skin texture, by Gustav Memmert, Berlin, Germany c.1890. This handsome beaker is 3 3/8" tall, 2 5/8" in diameter and weighs 107 grams or 3.4 ozs Troy. The excellent original condition and clear, crisp detail, with no monograms or removals, repairs or alterations, make this an especially attractive offering. The soft, warm, original finish is present, with no buffing or machine polishing. Large ornate pair of sterling silver three light candelabra in the Louis XV pattern by Gorham Silversmiths. 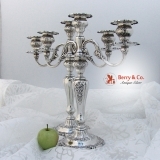 These beautiful candelabra are 15" tall, 14 1/4" across the arms, the candelabra are weighted. The excellent original condition and clear, crisp detail, with no monograms or removals, repairs or alterations, make this an especially attractive offering. 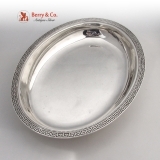 American sterling silver large round tray made by Porter Blanchard, c.1960. 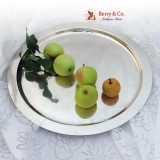 This simple yet elegant tray is 16 1/2" in diameter and weighs 1880 grams or 77.3 ozs Troy. The excellent original condition save for some minor surface scratches consistent with age, crisp detail, with no monograms or removals, repairs or alterations, make this an especially attractive offering. American sterling silver 50 piece flatware set in the Swedish Modern pattern by Allan Adler, 1969. 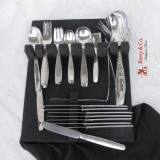 This elegant set consists of: 8 Knifes solid silver handles 8 3/4"; 8 Forks 7 1/2"; 8 Salad Forks or Dessert Forks 6 3/8"; 8 Gumbo Soup Spoons 6 5/8"; 8 Teaspoons 5 7/8"; 2 Pcs Large Salad Serving Set 10"; 1 Serving Spoon 7 7/8"; 2 PCS Lettuce Serving Set 10 3/8"; 1 Pie Server 9 1/4"; 1 Cold Meat Serving Fork 8"; 1 Platter Spoon 12 1/4"; 1 Sugar Shovel 6 1/8"; 1 Butter Knife 6"; Total weight is 3438 grams or 111 ozs Troy. The excellent original condition and clear, crisp detail, with no monograms or removals, repairs or alterations, make this an especially attractive offering. 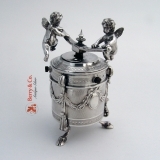 Magnificent French First standard sterling silver figural pepper grinder. This beautiful grinder is 3 1/2" across the handle, 4 3/4" tall and weighs 385 grams or 12.4 ozs Troy. The excellent original condition and clear, crisp detail, with no monograms, removals, repairs or alterations, make this an especially attractive offering. American sterling silver tea caddy in the Repousse pattern by Jacobi & Jenkins, Baltimore, c.1890. 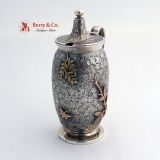 This beautiful tea caddy is 4" tall, 3 1/2" in diameter, and weighs 180 grams or 5.8 ozs Troy. Monogrammed on the bottom EFD in an ornate period script. The excellent original condition and clear, crisp detail, with no removals, there is an old repair on the body. American coin silver octagonal paneled floral, scroll and floral chased napkin rings,pair, having beaded rims c.1860, wih one inscribed: Boobie, the other: Cuddles. The inscriptions may be later, but who cares? Without a doubt, the best named pair of napkin rings we have ever had. Weighing a total of 75 grams or 2.4 ozs. Troy, each of these wonderful, large napkin rings is 2 1/8" in diameter and 1 1/2" tall. Inscribed as described above, the soft, warm, original finish is present, with no buffing or machine polishing. The excellent original condition and clear detail, with no removals, repairs or alterations, make this an especially attractive offering. The price is for the pair, as if we could separate Boobie and Cuddles. 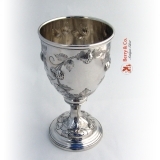 American coin silver goblet having allover floral Repousse decorations, a base having a Greek Key rim and an applied, pierced crescent rim, with a period inscription: E. J. Hall. 1859. Weighing weighing 150 grams, this impressive goblet is 6" tall and 3 1/2" in diameter. Inscribed as described above, the soft, warm, original finish is present, with no buffing or machine polishing. The excellent original condition and clear detail, with no removals, repairs or alterations, make this an especially attractive offering. American coin silver presentation goblet having a floral Repousse body with applied beaded rims and inscribed, in ornate, period script: TF to SOWH, c.1860. This very attractive goblet is 6 1/8" tall, 3 1/2" in diameter and weighs 197 grams or 6.3 ozs. Troy. Inscribed as described above, the soft, warm, original finish is present, with no buffing or machine polishing. The excellent original condition and clear detail, with no removals, repairs or alterations, make this an especially attractive offering. 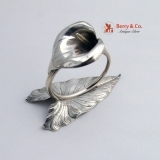 Vintage sterling silver figural lily napkin ring by Whiting, c.1880. This beautiful napkin ring is 3" long, 1 1/2" wide, 2 1/4" tall and weighs 43 grams or 1.4 ozs Troy. The soft, warm, original finish is present, with no buffing or machine polishing. The excellent original condition and clear detail, with no monograms or removals, repairs or alterations, make this an especially attractive offering. American sterling silver oval serving bowl in a Greek Key pattern by William Gale Jr. Silversmith, 572 & 574 Broadway New York City, c.1865, having a most unusual advertising mark: Established 1821 surrounding an embowed arm holding a planishing hammer. This desirable and useful bowl is 11 1/2" long, 8 5/8" wide, 1 1/2" deep and weighs 526 grams or 16.9 ozs. Troy. The soft, warm, original finish is present, with no buffing or machine polishing. The excellent original condition and clear, crisp detail, with no monograms, removals, repairs or alterations, make this an especially attractive offering. American sterling silver Art Deco water pitcher in the Orchid pattern by International Silversmiths, c.1930. Having a capacity of 5 pints, this exquisite pitched is 9 1/2" tall, 10" from handle to spout, 6" long, 4 1′2" wide and weighs a substantial 958 grams or 30.9 ozs. Troy. 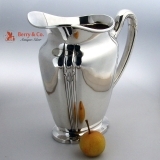 Marked International sterling and the old helmeted s mark, 5 Pts, Orchid and patented, this is one gorgeous pitcher. The excellent original condition and clear, crisp detail, with no monograms, removals, repairs or alterations, make this an especially attractive offering. American coin silver Medallion napkin ring, c.1860. This handsome massive napkin ring is 1 7/8" in diameter, 1 5/8" tall and weighs 101 grams or 3.2 ozs Troy. Inscribed Sherry, Lottie in a period script. The excellent original condition and clear, crisp detail, with no removals, repairs or alterations, make this an especially attractive offering. The soft, warm, original antique finish is present, with no buffing or machine polishing.